Having enjoyed last year's "green" Birdathon, which I did entirely on foot, I decided to take a similar approach again this year. This year my choice of location was largely dictated by my busy work schedule - I happened to end up with a day off while in Toronto, and figured that would be a great opportunity to revisit some old haunts that I haven't had a chance to get to in many years. I knew that I could walk a good long distance through green spaces from my parents' house in Scarborough (where I was staying), but allowed myself the option of modifying the "green" Birdathon into a "greenish" one by hopping on public transit later to get to some other parts of the city for a better variety of habitats. The rules of the Birdathon are that the count must be done within a single 24-hour period, but as it turned out I ended up being out for exactly 12 hours this time ... what follows below is an illustrated summary of my travels and sightings. The sun rising over Lake Ontario, as viewed from Guildwood Park. I began my Birdathon at 5:20 am, half an hour before sunrise. Before I reached the end of the block, I was already at 10 species. Most of these were the usual residential area species such as American Robin, House Sparrow, House Finch, Mourning Dove, Black-capped Chickadee, Northern Cardinal, and Common Grackle, but I also heard my first Baltimore Oriole of the day, plus Chipping Sparrow and Red-winged Blackbird. Heading into the west side of Guildwood Park it was still a bit dark, but many other birds were already singing. 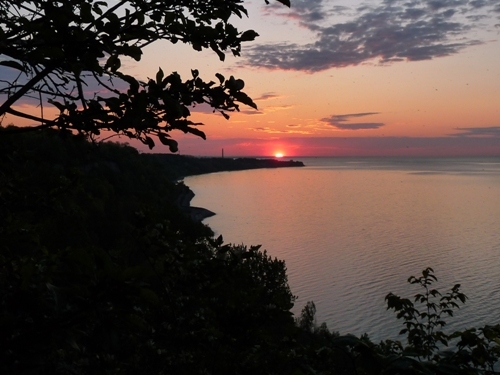 By the time I reached the edge of the Scarborough Bluffs to enjoy a nice sunrise, my list had grown to 23 species. Most notable in this group were the several Common Loons providing a nice offshore serenade, and a trio of early-rising flycatchers (Eastern Phoebe, Eastern Wood-Pewee, and Least Flycatcher) on what would prove to be a very good day for them. 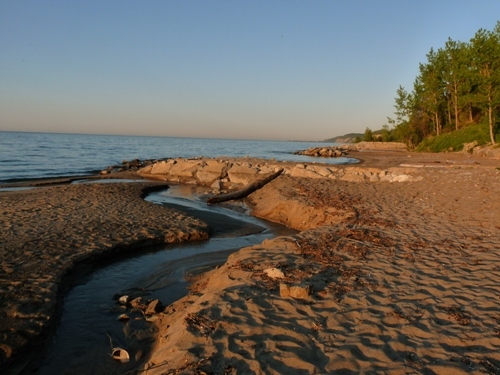 Looking west along the Lake Ontario shoreline between Guildwood and East Point parks. Notably scarce among the pre-dawn observations were the warblers - only Yellow Warbler was awake and singing that early. Toronto had experienced a significant warbler migration several days earlier, but with this being the third very warm and sunny day in a row I expected that most had continued north, and the early silence made me wonder how well I would fare with this group of species. Fortunately, I didn't have to wait long for some reassurance. As sunlight began to filter into the woods, many other birds began to sing. In one particularly productive patch of Guildwood Park, I had six warbler species at once - Black-and-white, Pine, Bay-breasted, Magnolia, Black-throated Blue, and Ovenbird ... plus Great Crested Flycatcher to add to the flycatcher count. As I passed by the old Guild Inn, I had the day's first Chimney Swifts flying overhead, and by the time I followed the path down to the lakeshore I was an hour into my day, with a count of 41 species. 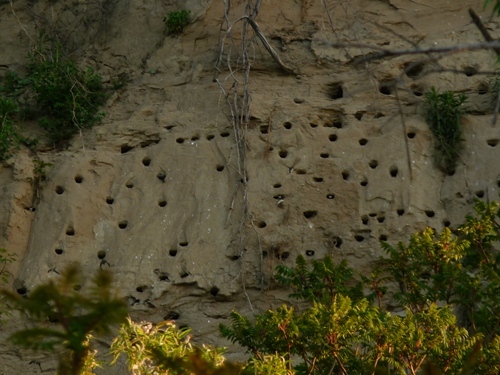 Part of the large Bank Swallow colony along the Scarborough Bluffs, with a closeup below showing one coming in for a landing and a couple of others peering out of their holes. My original plan had been to walk east along Guildwood Parkway, but once I was down by the shore I thought it would be more interesting to walk east along the beach. 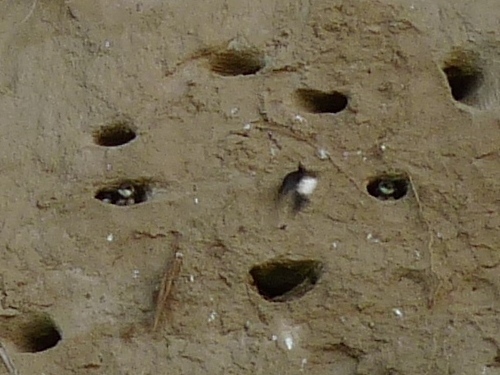 My hopes were slim for shorebirds, so their absence didn't surprise me much; instead I was happy with a large and active Bank Swallow colony, probably in the order of 150-200 birds. Of course, eventually I did need to get back up ... and let's just say that it won't take much more erosion before the path I took is gone completely! Awaiting me at the top of the slope was a nice birch grove that hosted several "new" warblers (Nashville, Black-throated Green, and American Redstart), plus a sneakily silent Yellow-bellied Sapsucker that I spotted while looking up into the canopy for the Black-throated Green Warbler. The sapsucker became species #50, roughly 90 minutes into the day ... things were going much better than I had dared hope (recall that in last year's Birdathon, my first attempt at doing one entirely on foot, I only reached 50 species all day). 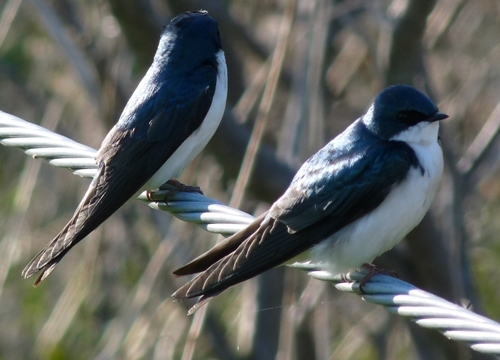 A pair of Tree Swallows perched near their nest box in East Point park . I continued on to East Point Park, one of my main targets for the day, based on not only my own past great experiences there, but also recent reports of a tremendous variety of warblers. As I endured a brief stretch of noisy road to get to the park, I mused that I should be able to find another 10-12 species there before heading on to Highland Creek. Remarkably, I had those 10 species within my first 50 metres inside the park! Blackpoll, Tennessee, and Yellow-rumped Warblers were all singing and flitting about a small grove of willows in the company of a Warbling Vireo; Canada Warbler and Swainson's Thrush were chiming in from a young mixed-wood stand on the opposite side of the path; White-crowned Sparrows were flitting from bush to bush around me; both Alder and Willow Flycatchers were giving their distinctly contrasting calls from the scrubby area beyond, and at least one Common Yellowthroat was singing from the same area. After that initial flurry, things did calm down a bit. The central part of the park added only Tree Swallows and a Great Blue Heron flying overhead, but I knew the woods at the east end held promise. Sure enough, as I stood by a couple of spruce trees trying to figure out which warblers were lurking within (a Chestnut-sided, to my surprise), a Lincoln's Sparrow popped up briefly from the ground, giving me a gorgeous look at it. At this point I was still missing White-throated Sparrow, but a bit of searching in suitable habitat nearby turned up one scuffling in the leaf litter. It occurred to me that almost all the birds were "behaving" very nicely indeed, i.e. occurring in places where I had seen them before and was expecting them, or else coming out to pose nicely for me. The stormwater pond at East Point park - pretty, but largely devoid of bird life. Despite all my good success so far, one thing was becoming apparent - waterbirds were going to be a challenge! I suppose I have become used to the prairies, where it seems like very little puddle has at least one or two ducks or shorebirds associated with it. On the other hand, I had seen only a few ducks, gulls, and cormorants along several kilometres of Lake Ontario, and the reasonably large cattail-lined stormwater pond at East Point was being patrolled by a lone Mallard (either a reflection of the site's unattractiveness, or an indication of a particularly aggressive duck!). Just before I turned inland along Highland Creek, I heard (and subsequently saw) the day's first Common Tern and finally had a Canada Goose in the distance, bringing the total to 68 after roughly three hours. 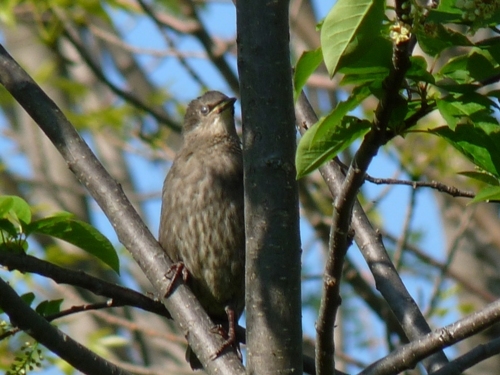 It was an unusually early spring this year, and as such there were a surprising number of young birds about already - most of them European Starlings like the one above, but also American Robins, and Common Grackles, as well as Canada Geese (which are to be expected by mid-May in any year). 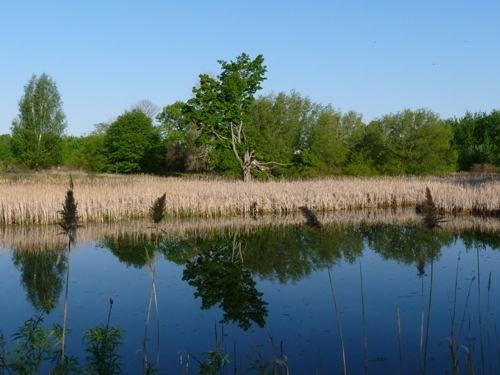 Highland Creek is one of Toronto's lesser ravines, but has some of the best woodland habitat in the city, and I have spent countless hours birding there in the past. I've only walked the south end of the valley a couple of times before though and didn't remember seeing much there, so had low expectations, thinking I might only get another three or four species until I reached Morningside Park ~4 km upstream, which I was more familiar with. Once again, expectations were exceeded. Species 69 was a Rock Pigeon flying overhead - hey, every species counts equally for a Birdathon! It was followed up by the first of four Belted Kingfishers along the lower stretch of Highland Creek, the only place I ended up seeing them all day. 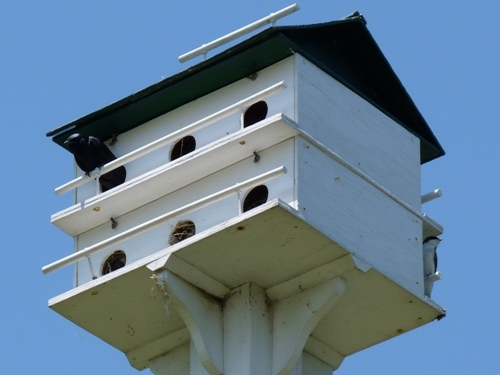 A roost of a dozen American Crows was a bit of a surprise since the Toronto area population seems to have never recovered well from West Nile Virus several years back. But the bigger surprises were Northern Parula and Philadelphia, both rather uncommon migrants that showed nicely for me right along the path. It turns out though they were only setting the scene for what was the biggest surprise of the day, a Red-bellied Woodpecker. Several historically more southern species have been increasing in numbers in Toronto (and surroundings) over the past couple of decades. Northern Cardinal has had a presence here for decades but is continuing to expand - record numbers have been recorded on the Toronto Christmas Bird Count more years than not over the past decade, and there was rarely a moment during this year's Birdathon that I was out of earshot of a singing male (my very conservative sum for the day was 75 individuals). Blue-gray Gnatcatcher is a more recent arrival; I recall that by the late 90s it was possible to find them semi-regularly right along the lakeshore, but I was surprisded at how many I was encountering, and how far inland - my estimate was 24 individuals, again rough and probably well below the true number. The Red-bellied Woodpecker though is an even more recent arrival, and while I'm a bit out of the loop now with the latest status of Toronto birds, I'm not aware of any known nest records from the city - but this one was poking its head into a suitable-looking hole while conversing with a (presumed) mate nearby, so prospects look promising. 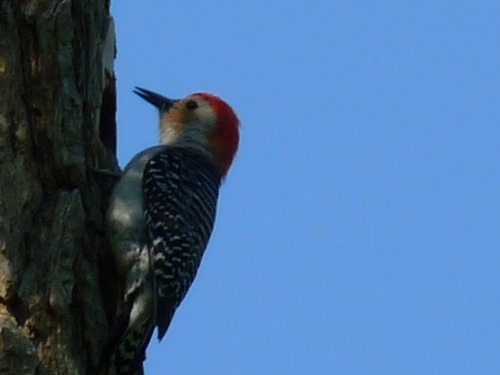 Red-bellied Woodpecker just outside what is presumably its nest cavity. Post-woodpecker, I continued along the creek, pausing to enjoy my first raptor of the day (Turkey Vulture, species #76) and a couple of Cliff Swallows under the Lawrence Avenue bridge (it was just a matter of time until I came across a bridge with them somewhere in the city). Just before Old Kingston Road I poked into a nice swamp, where the waterfowl were again disappointing (a lone Canada Goose), but I found a Solitary Sandpiper and heard a Northern Waterthrush on the far shore, bringing my warbler count to 19 species. The next stretch of the park was actually a bit disappointing, yielding only Killdeer and Barn Swallow as new species, both of which I knew I would have been able to find easily elsewhere later on. I had hoped that the mature forest below the University of Toronto campus would yield one or more of Red-breasted Nuthatch, Brown Creeper, Golden-crowned Kinglet, or Scarlet Tanager, all of which I've had there in the past, but I struck out on them all, and crossed over into Morningside Park with 81 species on my list. I've probably spent as much time in Morningside Park as any other Toronto park, so was quite surprised at how much had changed - largely because the old beaver pond finally dried up, succession was following its natural course, and all the old trails associated with the viewing of the pond had pretty much grown over. Given the changes, I wasn't too surprised that my hoped for Mourning Warbler wasn't around, and I also had no luck locating the Cooper's Hawks that have nested in the park for years. I continued to do well with woodpeckers though, bringing my list up to six species (probably my best ever count on a Birdathon) with the addition of Hairy, Pileated, and Northern Flicker. Climbing the staircase on the way up to the Rouge Health Centre I found myself at eye level with a beautiful male Indigo Bunting. That raised my total to 85 species after exactly 5 hours, and approximately 18 km of walking according to my GPS. 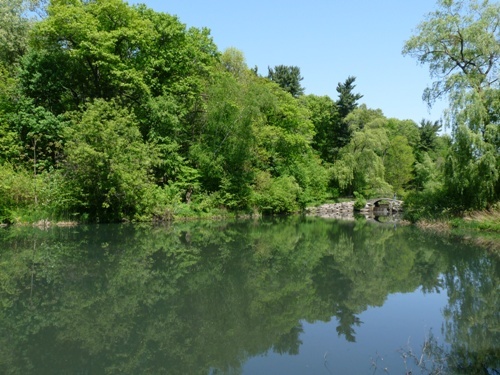 One of the ponds along Spring Creek in High Park. Admittedly I was ready for a bit of break at that point, and I had also pretty much run out of "new" habitat that I could reach on foot from this part of the city. So, I hopped on the bus (then the subway) and crossed town to High Park. As I entered the park I glanced up and spotted a Cooper's Hawk soaring on thermals, a species I've rarely seen in the park except on migration. With some of the best remaining Carolinian forest in the city, it had the potential to offer up some additional southern species such as cuckoos, Orchard Oriole, or overshooting warblers, a few of which occur there every spring. However, it was midday when I arrived, and between the temperature being in the mid-20s and the number of people the beautiful sunny weather brought into the park, bird life was pretty quiet. The only songbird I was able to add to my list was Orange-crowned Warbler, quite the opposite of what I had expected! 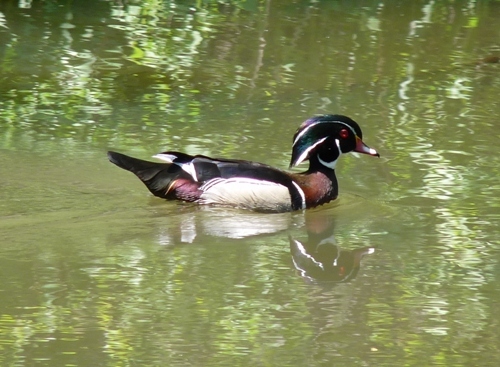 Species #87 for the day, Wood Duck. I was reasonably certain that I'd be able to add Wood Duck to the list in High Park, but had no idea it had become so common in the years since I last visited - in total I counted 14 individuals, and all but one were males, suggesting that at least some females were probably off incubating. The southeast pond has historically been good for herons and egrets, and I did manage to get a glimpse of a Black-crowned Night Heron skulking among the willows, as well as a pair of Mute Swans on a nest. Moving over to Grenadier Pond I added a Spotted Sandpiper, but was disappointed to see that the old Purple Martin condominium on the east shore appears to be completely taken over by House Sparrows. Not much later though, I was pleasantly surprised to find a new one on the south shore, occupied by at least one Purple Martin, the first one I've seen anywhere in three years! A male Purple Martin looking out from one of the nest holes, while a Tree Swallow inspects one on the back side of the condominium. My intent at that point was to hop on the streetcar and continue west along the lakeshore, but by this point my legs seemed to be walking by themselves, so instead I continued under the Gardiner Expressway and out to Sunnyside Beach. It was now around 1 pm, and closing in on the day's high temperature of 28 Celsius ... plenty of people were out on the beach broiling in the sun, but I was more eager to get back in the shade! Checking the beach did prove worthwhile though, as a lone Bonaparte's Gull was swimming among the more common Ring-billed Gulls. 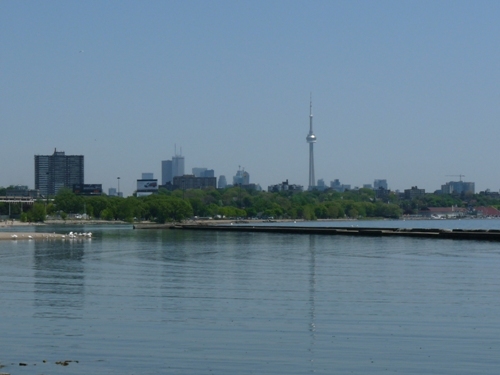 Looking east toward downtown Toronto from Sunnyside Beach ... the white blobs on shore are Mute Swans. Since my last visit to the area a good number of years back, a nice path has been made connecting Sunnyside to Humber Bay Park ... so I kept walking some more. My efforts were rewarded with a few Gadwall and a lone Caspian Tern, but there was no question returns were getting much slimmer for effort beign expended. All the same, having reached 95 species by that point, I was determined to see whether I could get to 100 for the day. At this point I did finally get on the streetcar and rode west to Colonel Samuel Smith Park, certain that I could count on it for some shorebirds. Conditions weren't good though, and all I could find on that front was a lone Least Sandpiper. The Savannah Sparrow out on the peninsula was another one I knew I could count on, but I though Northern Mockingbird would also be an easy find and was unable to come up with one. After a solid hour I was still stuck on 97 and although I knew of one "easy" bird remaining, I wasn't sure anymore that I'd be able to come up with two other new ones on an increasingly muggy and summer-like afternoon. 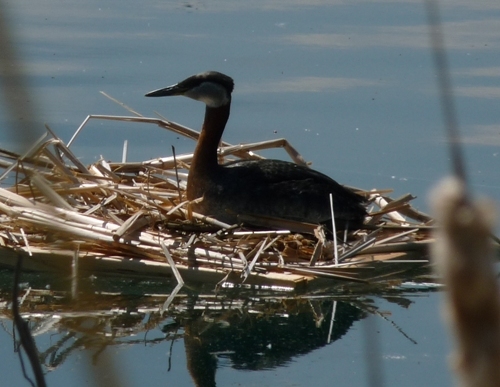 A Red-necked Grebe on a nest at Colonel Sam Smith Park - the first time I've seen one nesting in Toronto. It didn't count as a new species though, as I had already seen two off of Guildwood Park in the morning. I rode the bus up to Kipling station, and then made a point of watching out the window as the subway headed east, knowing that Norther Mockingbirds love the railway tracks in the west end. Sure enough, a couple of hundred metres out of the station, there was a mockingbird perched on the fence beside the tracks. I got off at the next station for one of my easiest birds of the day, Peregrine Falcon at the nest site that has been occupied annually since 1997 - the female was soaring in the note afternoon air and even made a couple of playful stoops as if for my benefit. So that took my total to 99 ... tantalizingly close to 100, but I was short on ideas of what to try next! Lacking any better ideas, I walked east to Royal York station, hoping there might be an American Black Duck in the creek, but the odds were slim, and I came away empty. Back on the subway I reviewed my list of species and realized my best bet to reach 100 was probably Red-tailed Hawk - a relatively common species in the city, also likely to be up and soaring in this weather ... but where specifically to look for one was the question. I know a pair is resident around Queen's Park, but the thought of heading down there in rush hour didn't really appeal to me, so I thought I would try my luck looking out from the subway as it crossed the Don Valley. No luck - but in glancing down at the river to the north, I spotted my elusive Black Duck instead! Then while riding the bus home along Eglinton, I did finally see a Red-tailed Hawk off to the north, proving that sometimes it's better to just let the birds show up where they will rather than trying to search out the perfect spot. 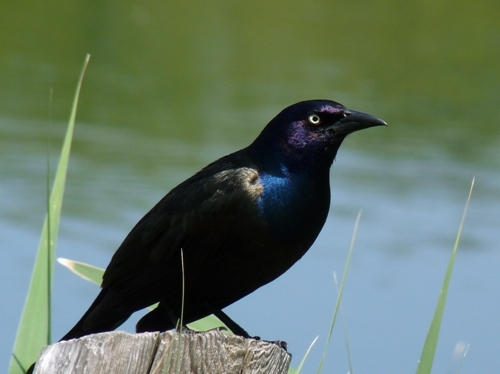 A Common Grackle posing nicely by Grenadier Pond in High Park. As I got home, I realized it was 5:20 pm, exactly 12 hours after I had left in the morning. I could have continued to dusk and beyond, but probably wouldn't have added much more considering how warm it had become. Plus, I had already walked a fair bit further than expected. My GPS tracks from the first five hours showed a roughly 18 km walk, and the High Park to Humber Bay route added another 11 km. After that my batteries gave out, but the Colonel Sam Smith and Islington to Royal York walks must have added up to at least another 5 km, for a total of 34 on the day! Given that my total of 101 species was already more than I had expected to find within the city limits in a single day, I was content to have a relaxing evening instead of continuing my search. Breaking down my species list, my success was largely thanks to a great showing by songbirds, of which I counted 67 species, including 20 warblers, 7 flycatchers, all 6 swallows, 6 sparrows, and 6 finches, among others. Conversely, other birds were scarcer than on most of my previous Birdathons, with just 7 waterfowl, 4 shorebirds, and 3 raptors. The biggest misses for the day included American Kestrel, Wilson's Warbler, Orchard Oriole, Scarlet Tanager, and Swamp Sparrow, but there were far more species I discovered and hadn't anticipated, so I can't complain at all. The full list is posted below. If you've already contributed to my Birdathon this year, thank you so much for your support! Once again, we're counting on Birdathon proceeds to contribute significantly to our continued operation of migration monitoring programs at McGill Bird Observatory, where we are now in our sixth full year of operation and trying to maintain consistent coverage from year to year so that we can detect population trends over time. In case you didn't make a pledge in advance of my count, but would still like to support this year's Birdathon, it's not too late to make a flat-rate donation online. Thank you all!